We are each of us angels with one wing, and we can fly only by embracing each other. Gift certificates for a time of retreat, a soul-day or program are available at Spirit Mountain Retreat. They are a lovely way to celebrate someone's birthday or anniversary. Contact or (951) 659-2523 to make arrangements. This Spirit Mountain Retreat Journal and Sketch pad is perfect for writing down your reflections, favorite quotations, and gathering your dreams. The paper inside is just right--not too smooth, not too rough - Fox River Confetti, 50% post-consumer fibers, manufactured alkaline with archival properties for longer life. Bound with black wire and unlined. Size: 8.50" X 7". Consider one for yourself or as a gift for another. Make checks payable to Spirit Mountain Retreat. 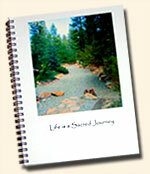 An anthology of writings from Spirit Mountain Retreat inspired at writing retreats led by Katya Williamson. An invitational site to serve those choosing to bring forth a positive future for all of us. Participate with Barbara Marx Hubbard in the work of conscious evolution. A center for Eco-Spirituality and the Arts in Kingstree, South Carolina, dedicated to creating beauty and participating as co-creators with the Divine for a sustainable future. A sanctuary in the Texas Hill Country for cultivating diversity: bio-diversity and cultural diversity. 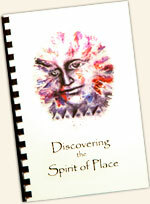 Sor Juana Press, one project of Santuario Sisterfarm, publishes books related to earth spirituality and cultural diversity. Enjoy the writings and reflections of this most significant contemplative monk, who lived in India from 1959 until his death in 1993. A pioneer in the work of inter-religious dialogue.